We are conducting a variety of collaborative research projects supported by the National Institutes of Health and other funding sources. The goal of this competitive renewal application will investigate how alterations in the osteocytic pericellular matrix regulate osteocyte mechanosensing of loading signals through in vivo and in vitro studies. For the first time, the missing link between tissue deformation and cellular responses will be elucidated. The results will help identify new targets to enhance bone’s response to mechanical stimulation, one of the most potent anabolic factor in bone growth and bone formation. The goals of this proposal are to (a) translate the unmet clinical needs into open-ended, team-based senior design projects to provide true bench-to-bedside problem solving opportunities, (b) broaden the students exposure and understanding of challenges that are specific to clinical environments while strengthening communication skills with clinical professionals, and (c) evaluate the effectiveness of the incorporation of clinically driven design projects into the senior design program. The goal of this project is to enhance UD undergraduates’ exposure to cutting edge and impactful Biomedical Engineering research in the campus. Abstract: Three core resources will be run through this award: (1) A cytomechanics core, first established in our phase II grant, will be strengthened to provide tools for orthopaedic researchers to study how bone, cartilage and ligament respond to stress and strain. This involves tools for bioimaging and micromechanical testing. (2) A patient specific modeling (PSM) core will be established. This is a modification and expansion of the motion analysis core established in our COBRE I award. It will provide a means to determine differences in tissue forces associated with pathologies and will also be used to determine biomechanical differences associated with various treatment paths, which may impact the development of osteoarthritis. (3) A clinical research core (the ResCore) will be established for the first time to aid us as we expand our clinical trials. It will provide patient database access and biostatistics support for all projects. 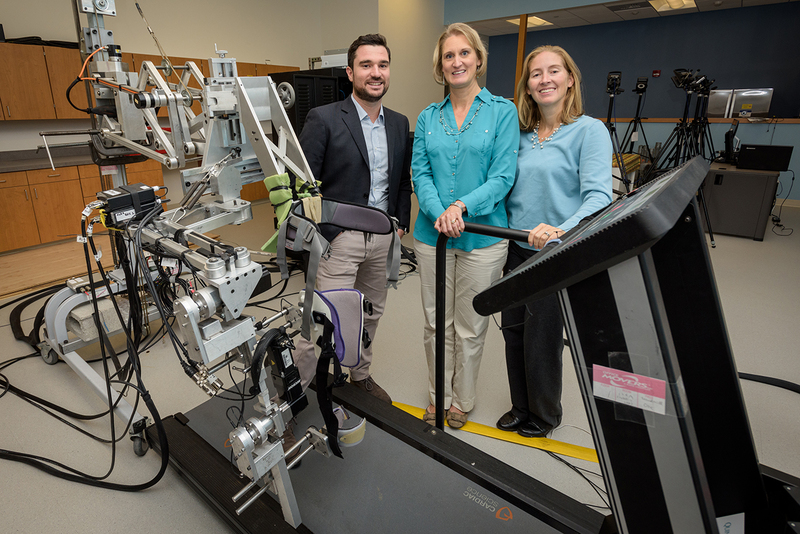 Abstract: This renewal application builds upon the success of our team in developing novel un-motorized and motorized exoskeletons and Functional Electric Stimulation (FES) systems for gait training of stroke and other motor-impaired patients. The goal of this project is the in vitro and in vivo investigation and development of a pharmacological treatment for Post-Traumatic Osteoarthritis (PTOA) based upon the local, intra-articular, administration of zoledronic acid, a bisphosphonate, to prevent cartilage degeneration within a murine model of surgically induced PTOA. Collaborators: Randall Duncan Abstract: This proposed research will delineate the transport mechanisms that are essential for osteocyte viability and bone mechanotransduction, and provide new insights into mass transport in other biological and engineered systems such as tissue engineering scaffolds.